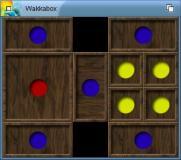 Description: Difficult Klotski sliding block puzzle. but it has been implemented many times in code and with real wooden pieces. Drag the blocks around, get the big red one opposite where it starts. 'R' key   = Restart puzzle. 'Esc' key = Quit puzzle.